Just like the recipe – Grilled Pork Chops with Mexican Flavors and Colors this dish was inspired by the colors of the Mexican flag. The red bell pepper and the poblano pepper represent the red and the green on the flag and the white is represented by the onions, coconut milk and rice. Not only is this a very colorful rice, but a very tasty one too. 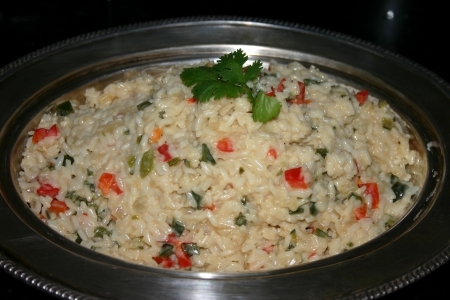 The addition of coconut milk to rice dishes creates a unique and creamy flavor. In a large deep skillet heat oil over medium heat. Add onion, peppers and sauté until tender and translucent. Add rice and sauté until rice changes color to a very light brown. Add all other ingredients and bring to a boil. Reduce heat to low and simmer until all liquid is absorbed. About 20 minutes.